You are very correct, Tommi. The new ferries are considerably shorter than K.
Last day at home before starting at Munken tomorrow morning 8:00 AM. I will be on Munken until 18:00 when I switch over to "my" Lagatun for the rest of the night and days onwards. Weather forecast is not too good right now, so I surely will get baptised on the first day/ week. First, I hope that you'll have a great New Years eve. Then I hope that you'll have a successful first period with the new vessels. But you also got thrown into deep water, or babtised, with K. too, didn't you? I seem to remember something about bad weather, safety first and angry passengers? ...and here's when Captain switched over to Lagatun this evening. Lagatun now looks to be based in Rørvik for the night. Last edited by Seagull; January 2nd, 2019, 00:30. Reason: Added extra info. I'm currently serving both on Munken and Lagatun, as the concept of "my ship" has been discontinued. I'm serving whatever ship is there... but, they are exactly the same. There is minimal differences to the ships. This week, I'm doing night shifts on Munken. Every second night. Every second night? That must disrupt your sleep pattern, feeling either overtired or just not sleepy at all the wrong moments? The shift system is quite a challenge to get used to... and as of now, I'm not entirely sure of the exact rotations. Since January 1st, I've been doing 14 hour day-watches separated by 6 hours of rest. Since Sunday evening, I swapped from day to night watch. Night watches usually runs from 18:00 hours till 08:00 the next morning, then every other night. By Sunday morning, I'll most likely be done and heading for "vacation". I have had problems adjusting, I'm no longer a young fellow that has no problems readjusting. I need my sleep, and I need consistency. Tonight, on my night off, I got to stay awake as long as possible, preferably till early morning. Shift work is really hard! Sounds like a tough job! A constant journey. Yes I've always thought those alternate nights must be hard, and as you say it gets harder. After being on a 'day' week followed by a week on nights, I had been wondering if the next rotation would be first nights and then days as used to be the case. Actually I don't even know if it is 3 weeks off that you'll still get. And it is a bit mind-boggling to work out how or if the demise of the 'my ship' concept affects the former timings. Oh well, we'll see in due course. Surely there's a better way to run a ship. I think you have to study economics to put together this shift plan with a minimum amount of workers. Let's hope that this is running well and the failure times due to exhaust and illness are not too high to cause even more severe problems. We experience this in our hospitals: people are not able to fulfill too ambitious working schedules and so all these plannings do not work well. OT for just a moment, Ralf, but I thought the British hospitals were the only ones with problems! Roughly, there will be two weeks on, two weeks off... in a rotation of 8 weeks. And you are correct, Lady C, the day-night shift schedule alternates each time. I'm definitely getting older, and are not keen on these night shifts, but so far, it has been working out surprisingly great. And the ferries, the new ones, are beautiful ships. They are actually well designed ferries, but as usual, in my eyes, comes with a fair share design faults. The best ferry I have ever served on, was TIDEFJORD, now NORANGSFJORD. And I'm not the only one saying that. That was a very well designed ferry. 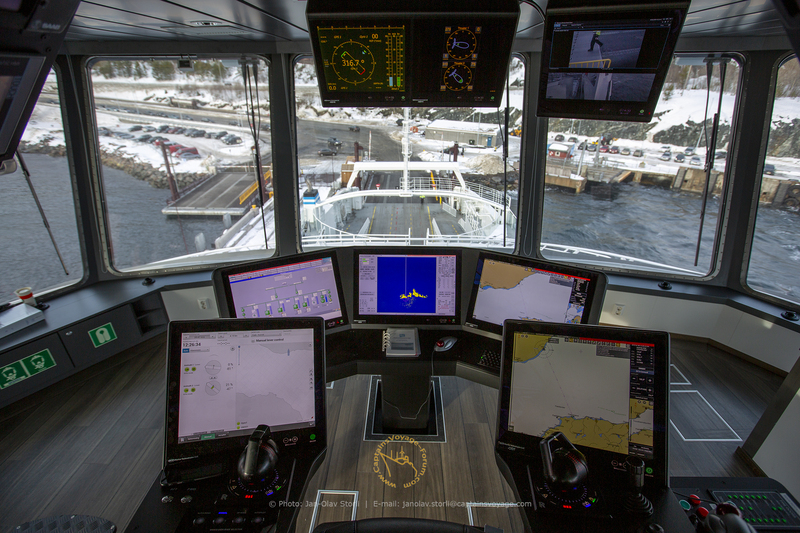 With let's say a 100 years of ferry-operation in Norway, I'm however quite SURPRISED that we have not fine-polished the art of creating the perfect ferry. Ferries designed after for example Tidefjord, should have been improved a little more each time. By now, the ferries being built and designed, should be as close to perfect as it is possible to come. Ferries from Norway, should have be extremely popular second hand ships to any where in the world, as soon as they are retired from service here. But, even after making something as good as Tidefjord, we stepped back again at many projects. This possibly includes both ships. Interesting amount of monitors. But the three in front are not only for the captain, right? BTW; can any of the screens be switched to CVF? How is normally a christening ceremony held? Is it not common to invite all new captains? I was surprised you weren't there. Or did you have to work? Thank you so much for dropping by Ralf and ombugge! Yes, there are a lot of monitors on this bridge, double in both ends. I hope within time to show you more of the bridge through my youtube account. I'm actually hoping to gain about 45 more subscribers so that I can do YouTube Live (need more than 100 subscribers). I uploaded a bridge view to my youtube today, showing our approach to Rørvik. We are able to place whatever picture / Information we want on any of he screens. Let me also say that I'm extremely pleased with the entire bridge, and the set-up, and find surprisingly few shortcomings to the design of my office. Within time, I may get a different view, but this is really a great work-space for me. Probably the best bridge I have ever worked on. And the best part, it's so extremely quiet up there.... hardly any sound at all. Coming from the K, where an air-outlet just outside the bridge made a lot of noice, this is close to heaven. IN THEORY, the screen could most likely be set to CVF homepage, but I guess it would NOT be recommended. LOL. Yes, you are correct, ombugge. The screen on the left armrest, does contain AUTOCROSSING. This screen is what we know of as the "Rolls Royce"-screen. From here, we control the thrusters and the different sailing-modes, as well as engaging the Autocrossing function (soon to be implemented). Autodocking is currently NOT set-up but it's made so that a possible future instalment can be done. The christening ceremony for Lagatun and Munken was held at this dock a few weeks back. Only building captains were invited this time, and it's up to each individual company how they do it. I will however be attending the Fjord1 double christening ceremony at Brekstad this coming Monday: for VESTRÅTT and AUSTRÅTT (Fjord1 vessels now operating at Brekstad - Valset). They chose to make a huge party for everybody interested, and I suspect that there will be a LOT of people attending.